It’s been a bit of a catch-up week for us so you will notice we did not complete an Alphabet Letter. Rather, we’re going to finish everything we’ve started so we can start fresh in a few days. Speaking of fresh, we had an experiment go wrong this week. We’ve been looking after this sugar pumpkin for the past couple of weeks and thought we’d carve it for a baby jack-o-lantern. Whoops! It completely caved in and all of the innards came swooshing out all over the table when we tried to lift it up. The children were very keen to look at it and give it a poke. The pumpkin smell was a little troubling for the first part of the day. We’re a little behind in making our October self-portraits as duty called for us to make our Boho Birds, but we’re all caught up now and what a difference from September! We had fun drawing in the backgrounds. We reviewed our Big, Bright and Beautiful criteria for the children. Big means to fill your space, Bright means to use five colours or more and Beautiful is to do your personal best. Don’t you think the children did a great job? We were delighted for sure. 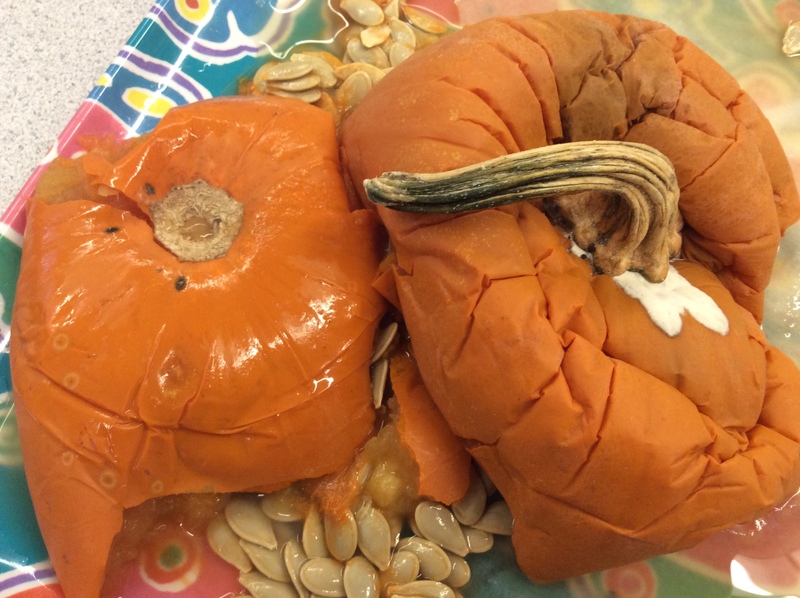 Talk about filling your space…look at the size of these painted pumpkins! We read Too Many Pumpkin by Linda White and Megan Lloyd, then proceeded to draw pumpkin outlines with ribs using white pastel. This is a favourite project of ours, from deepspaceparkle It was very interesting to watch the children work on a large scale – the biggest piece of paper (12” x 18”) we’ve asked them to fill this year. It can be hard to go big. Not all children realize they really have to move their hands and arms to stretch to fill the corners of a big sheet of paper. They need their helping hand (their non-writing hand) to hold the paper down or the whole thing will slide. It’s a lot of think about. It seemed we just got the outlines done when it was time to paint the pumpkins. 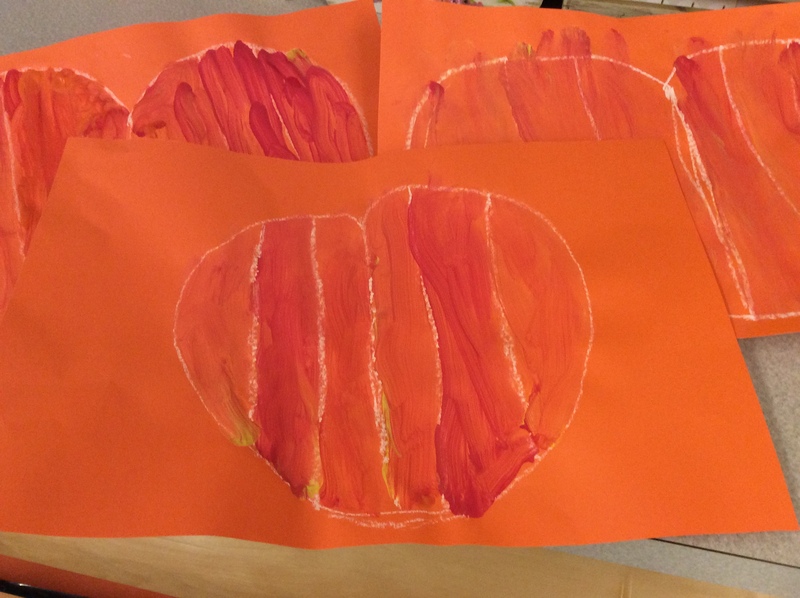 Colour mixing is fun and an important skill, so using palettes of orange, red and yellow paint and a single paintbrush, the children mixed the colours for various shades of orange in each section of their pumpkin. We will cut them out next week and decorate appropriately. Of course, this week’s big event was our Hallowe’en Centres Party. We’ve learned through sad experience we cannot host our party and participate in the annual Ridgeview Parade and Assembly (next Wednesday, October 31) all in a day. The children (and teachers) get overtired, self-regulation is almost out the window and nobody wants to go Trick or Treating (“Can’t someone go out and bring the candy to me?” True story). It’s too much. So by dividing the two events, we get twice as much fun and it’s all round SO much more enjoyable for everyone. 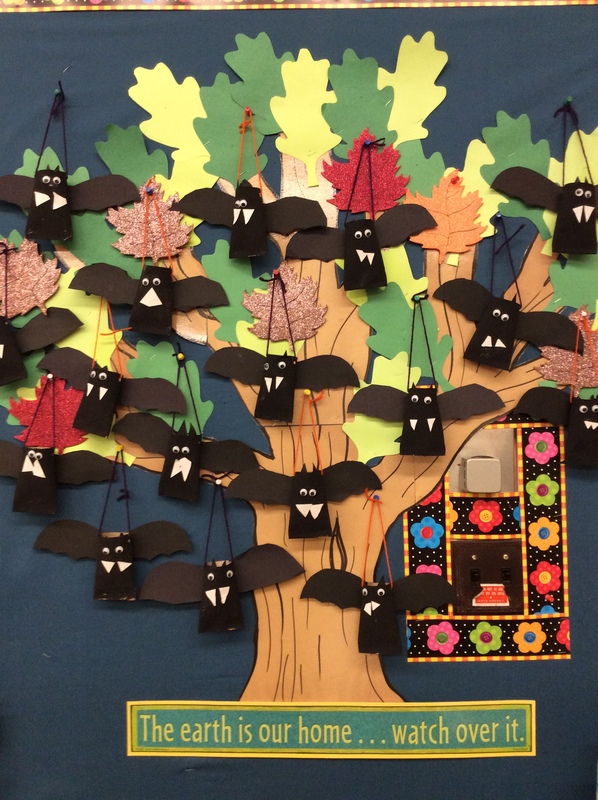 With the help of our UBC Teacher Candidates and parent volunteers, the children created math patterns, finished their bats, made necklaces and spooky trees, coloured Hallowe’en pictures and rolled out the playdough. We had a lot of giggles and admired everybody’s creativity. 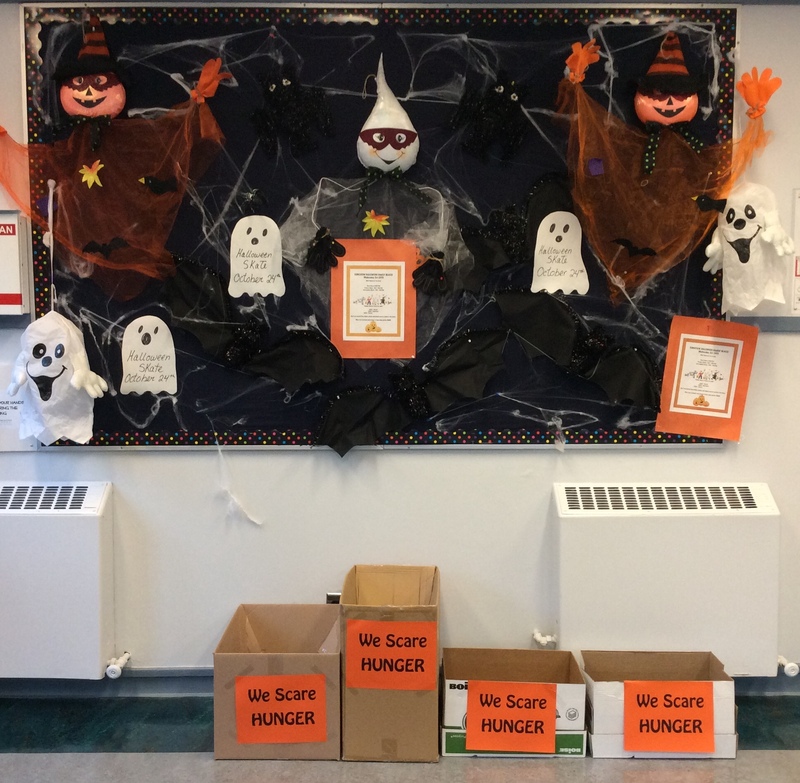 On a more solemn note, one of the Me to We initiatives that we carry out every year at Ridgeview is the “We Scare Hunger” campaign. We’re asking every student at school to please bring a couple of kid-friendly, non-perishable food items and either place them in the boxes upstairs in the main hall, or bring them to the classroom and we take them upstairs from here. We’re encouraging the children to think about what they like to eat, and that’s what they should bring to school. Our donations will be given to our sister school, Grandview Elementary in Vancouver, to restock the school’s food bank. Monday, October 29 is Photo Retakes. Please let myself or Mrs. Campbell know directly or via email if your child is having their photo taken so we do not miss anyone. Please return your Library Books for a new one. 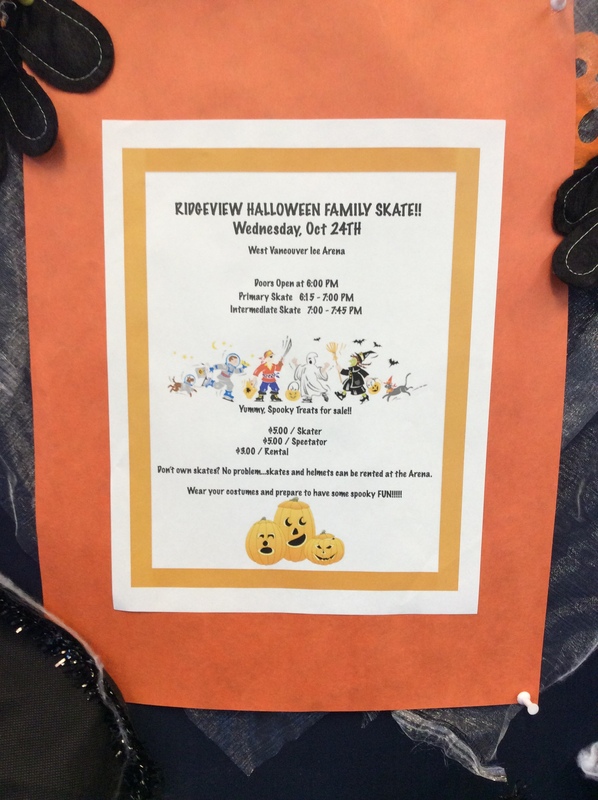 Wednesday, October 31 is Ridgeview’s Annual Hallowe’en Parade and Assembly. Parents are welcome to line the hallways and watch up parade through the school. Please do not ask your child to stop in the hallway for a photo – we don’t want to be separated from the rest of the parade. We sent home an orange notice on Thursday with all the details. We also sent it home via your Remind text. Thursday, November 1 is our delayed start at 10:40 am. You can now visit the cardproject.ca to see our class’s art work. Make your order by this Sunday and your delivery will be here at the end of November. 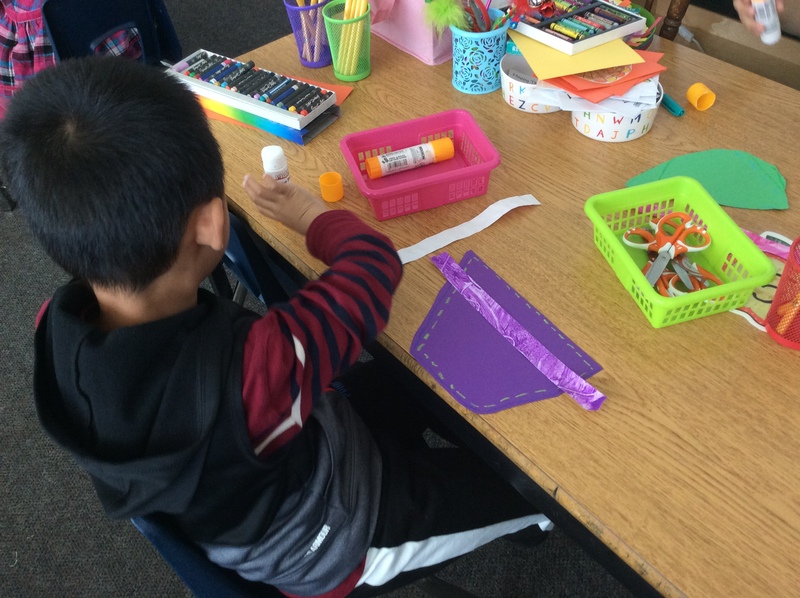 As you know, all Ridgeview students participate in the RPAC (Ridgeview Parents Advisory Council) fundraiser, “theCardProject.” Each student creates a piece of art work, which is then used as cards, journals and other stationery items. You’ll be able to purchase these items with your child’s art in the next few weeks. Right now, we’re in the process of completing our project. 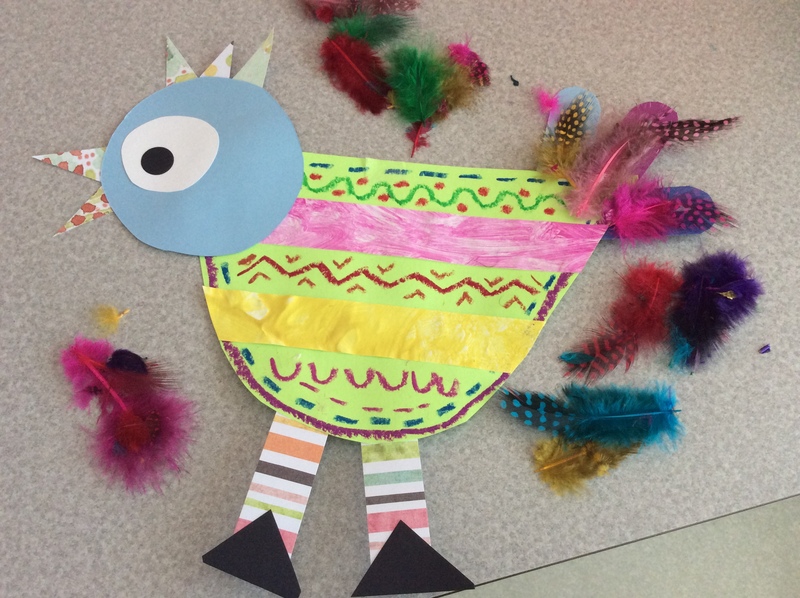 For the Kindergarten, we are making these delightful boho birds, based on Pattern Birds from DeepSpaceSparkle, an outstanding website and resource of art ideas for educators. We belong to the “Sparklers Club” (of course we do) which gives us further access to amazing projects we can make with your children. These projects are multi-step, complex and incorporate the fine motor skills not all children have had the opportunity to develop. We do a lot of tracing, cutting, pasting, drawing and painting in class. The activities also require the children to use the “big” skills of focusing on a task, listening carefully to instructions and following teacher directions. It also requires the children to “peer reference” which means look to others if you’re not certain of what you’re doing, or to confirm that you are on the right track! These spectacular birds took us two full art classes and two small group sessions to complete. On Day One each child drew a large “U” or smile shape with pastel on their ½ sheet of construction paper for the bird body. Then they drew a stitching line on the inside of the smile line and cut the body out independently. We had painted paper earlier in the week. One of the many great things about working with Christy is we like to divide and conquer so can get twice the benefit for our children. We each painted paper for two colours, cut the strips and shared them between our classes. We’ve been working on patterns in Math so the children created an AB pattern with the open space and painted paper (any opportunity to integrate and layer the learning, we will do). The children glued on the painted paper strips, turned the bird over and trimmed off the extras. The final step was teaching a variety of lines (stitched, wavy, zig zag) and dots to make the pastel pattern lines in the open spaces. After we had finished our first session, one of the children asked, “Were we in the green zone?” And our answer? 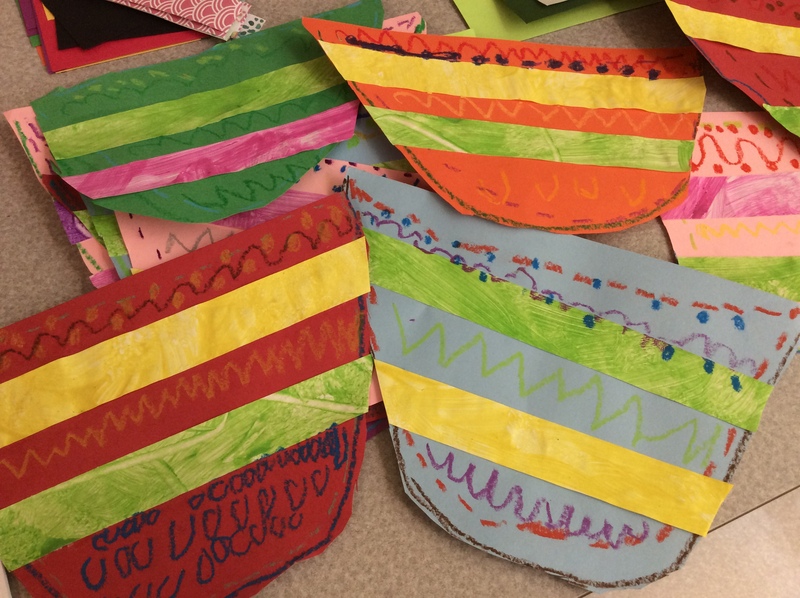 A hearty “YES!” because we know the depth of self-regulation this art project required, and we were so pleased the children were concentrating diligently to follow the steps in sequence. Day Two saw us working as a class on the bird heads. 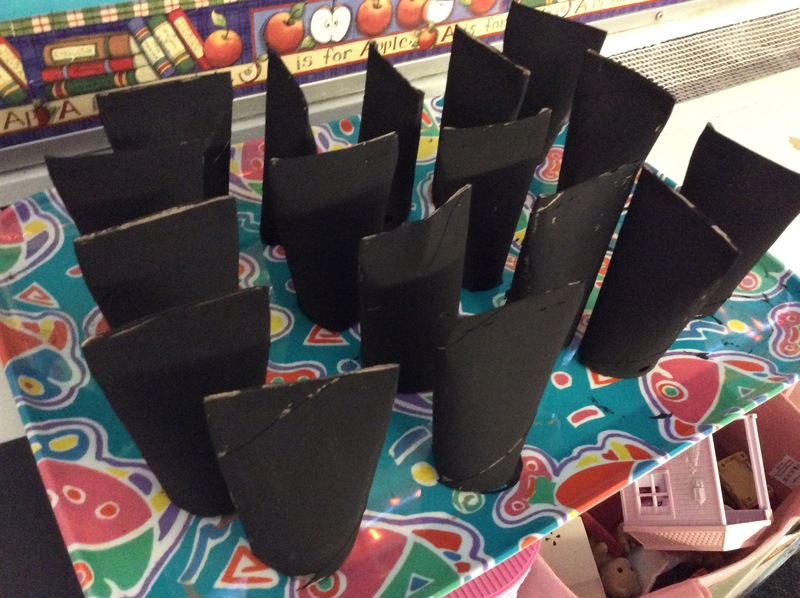 After choosing their pre-cut head, we gave each child a small black construction paper dot to glue onto white construction paper to cut and make an eye. They each chose five diamond shapes we pre-cut from scrapbook paper to form the crown and beak. We asked the children to put gluestick on half the diamond and place it on their bird. After we glued the head onto the bodies we felt our birds were really taking flight. 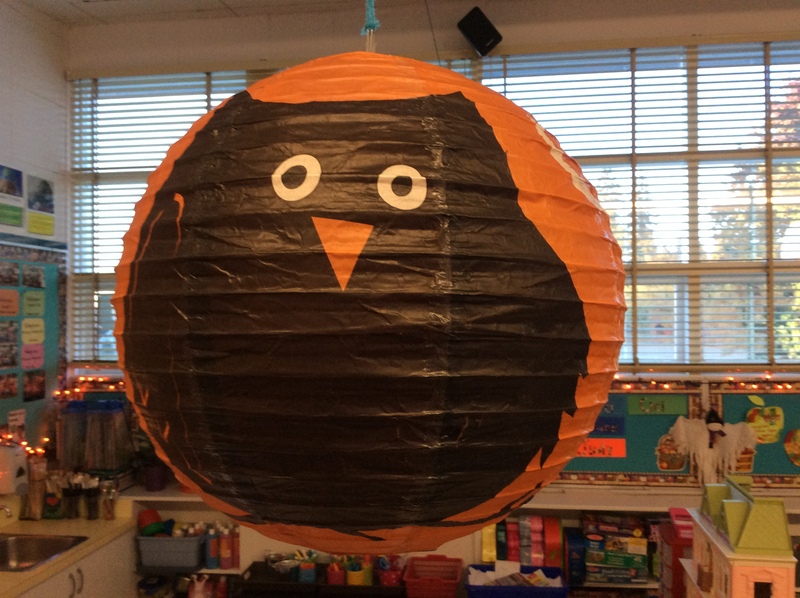 We worked in small, teacher-led groups during Activity Time to finish our birds. 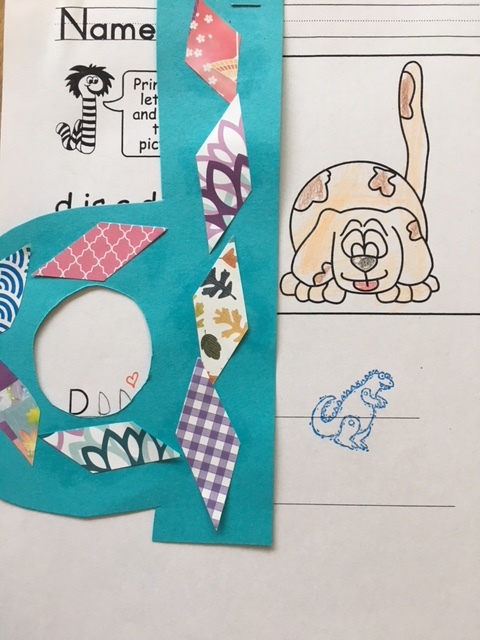 We asked the children to select, fold and cut scrapbook paper for the legs, cut out construction paper claws and glue on the paper feathers for the tail. On our last day we had some fun layering in feathers on top of the paper feathers and let the white liquid glue dry overnight. We weren’t sure we were going to make the deadline of October 11 to finish our sweet birdies. But make it we did, although we never like to rush in Kindergarten. The children are learning that time and patience are necessary requirements to make something they take can pride in, and want to say, “I made it myself!” We’ve said several times we like projects that take several days to complete so our children can learn about pacing themselves, anticipation and enjoyment of the process. Nothing is worse than rushing and feeling that completion of an assignment is a competition, where everyone must be first. 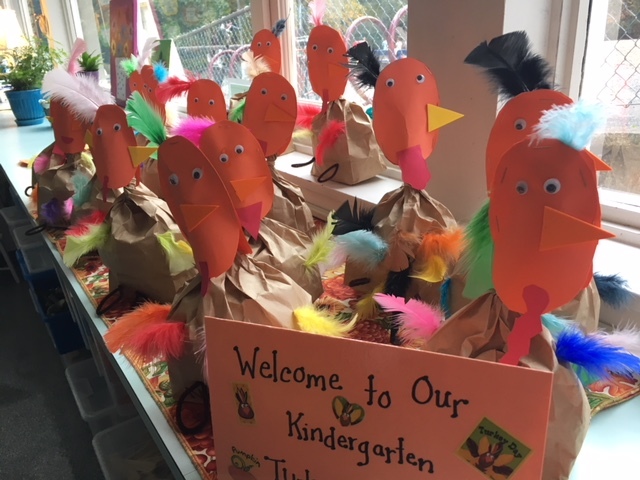 In thinking back on our boho birds, creating and expressing themselves by making great art is another excellent self-regulation strategy for the children. While we may choose to walk, run or deep breathe, Christy and I also know (as long time crafters) that the sight, smell and textures of paint, coloured paper, pastels and scissors goes a long way in helping us to down-regulate after a tough situation or long day. Our hands are busy, our minds focus on the task at hand and the possibility of “what might be” after our efforts hovers over us. One of the things we love as teachers is being to share our love of fun and creative activities with our children, so they can use them to help lift their mood, or simply relax. So when we get to work on a fun mixed media project such as this, we think we’re headed in the right direction. We’ll be making another big project soon, so check back with us to see how it’s going. Thank you again to Patti Palmer of Deep Space Sparkle for her inspiration! We always find this week before Hallowe’en preparations really get going a bit of a holding pattern. We’ve put up a few decorations (so as not to overly take away from our self-regulated classrooms), strung a few lights around the room and have started working on a few crafts in anticipation of the BIG DAY. In an informal classroom poll, deciding between Hallowe’en and Christmas as the classroom favourite produced some intriguing numbers, until we realized the participants were voting twice…. 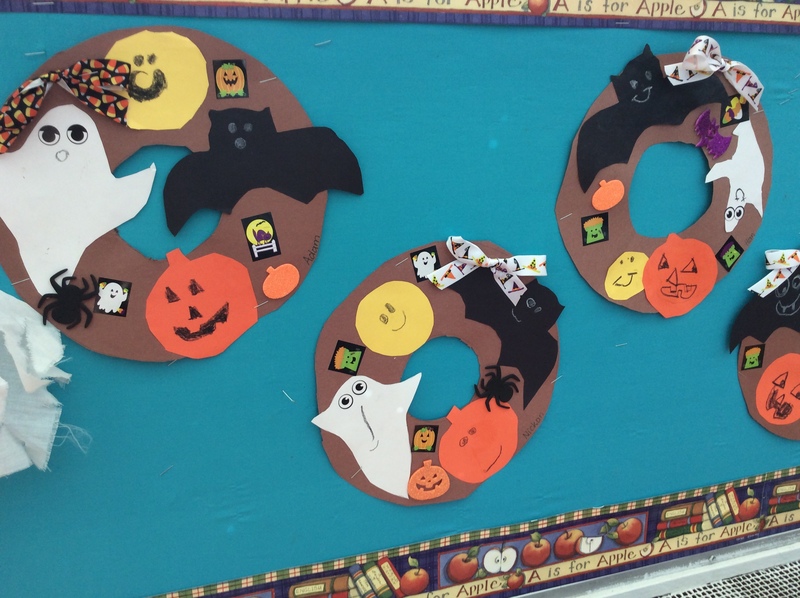 Last week we traced, cut out and glued together our Hallowe’en Wreaths with our Big Buddies. This week we added a lot of special details so create a beautiful bulletin board display in our classroom. We also painted the bat bodies for a cutie-pie bat craft we will finish next week during our Hallowe’en Centres party on Thursday, October 25 in the morning. 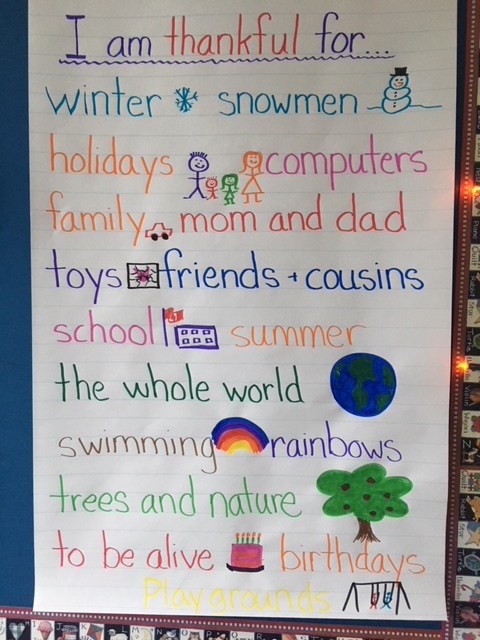 In Kindergarten, Christy and I like to have seasonal celebrations for our classes but we also like them to be productive. 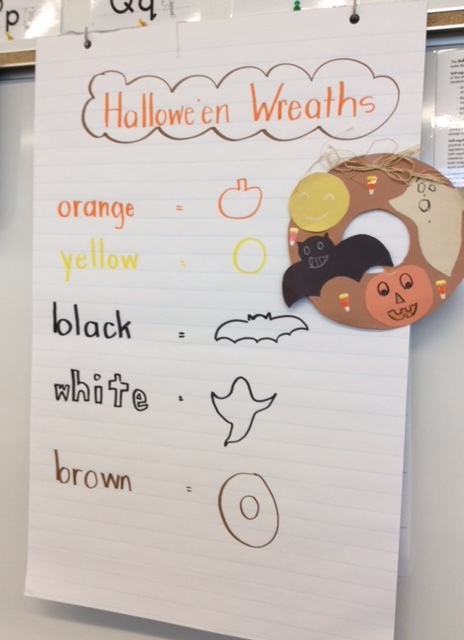 So now that our children have learned about Centres and rotating between the numbered tables in our classrooms (1-5), we’re applying that routine to something fun and new – crafts and activities on a Hallowe’en theme. There’s no need for children to dress up in costume, but if they would like to wear a fun Hallowe’en t-shirt or Hallowe’en headpiece (no masks, please), then that would be lovely. I’m trying to decide whether to wear my Witch’s Hat or Hallowe’en Princess Crown. Decisions, decisions…. A very important event this week was starting work in our Alphabet Books. We’ve been working on the loose Alphabet pages from A-D up till now. We’ve sorted and collated everybody’s pages and cerlox bound them into the children’s Alphabet Books and they are gorgeous (both children and the book). We’re so proud of our classes for learning to follow a routine for printing their names in pencil, printing the alphabet letters and drawing and labelling pictures that begin with the letter of the week. We teach and model each and every step, and will continue to do for the rest of the year for all the letters. 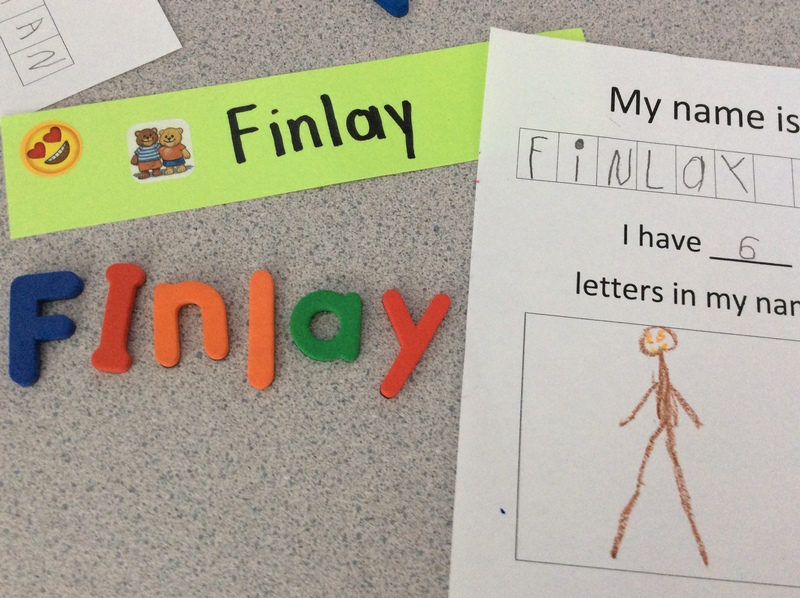 We’re really encouraging the children to use the lowercase letters we’ve taught in their names instead of uppercase and it’s exciting to see this transition. We’re continuing with Our Personal Identity in the Community and the Natural World portion of our Kindergarten Curriculum. Earlier, we read Chrysanthemum by Kevin Henkes, about a little girl who overcomes teasing about her name, Chrysanthemum, when she starts school. With the support of her loving parents and Music teacher, she comes to love and and appreciate her beautiful name. We explain to our children that the very first gift they receive from you after being born, is their name, a most precious and special gift, indeed. We had some fun searching through the magnetic letters the children used at their Welcome to Kindergarten visit to find the letters for their names. It was thrilling to hear them talking about the letters as being uppercase or lowercase, knowing they have substituted in uppercase letters for lowercase letters (we had a shortage of lowercase “a” and “n”) and everybody helping each other out to complete their names. A quick counting of letters and an autumn picture completed our activity. This week ended with an Earthquake Drill and full evacuation. We had informed the children ahead of time, had a practise so that when we actually had the Drill, there were no surprises. We’re going to really miss our children for the next few days. It will be the first long separation since school started – 4 days and 1.5 hours. They are starting to find their stride now as settled Kindergarten children. We see the children’s listening skills continuing to improve, they are remembering on purpose and waiting for the teacher to give instructions before independently starting their own work — all important parts of their self-regulation. So enjoy these beautiful autumn days and time together with your children. We know they will be growing even more mature with all of the sunshine that’s expected for the next little white. Friday, October 19 is a Professional Development Day. School is not in session for students. Monday, October 22 is a Non-Instructional Day. School is not in session for students. Please return your Library books for Tuesday. We are going to try to reschedule our Library time from Monday. Wednesday, October 24 is the Ridgeview Family Skate. Thursday is our Hallowe’en Centres Party as noted above. After the holiday weekend, it was hard to get our usual rhythm this week at school. Sometimes we find that when we miss our Mondays and not going to Library and Music on our regular days. But on this gorgeous Sunday as we write up the newsletter for our short week, it seems we were still very productive and have made some very good progress in all areas of our learning. This week we’re most proud of the beautiful boho birds we made for “theCardProject,” which is an RPAC fundraiser for our school. Each classroom teacher selects an art project to make with his or her class, and these often incredible pieces of art are turned into cards, journals and other stationery items. We’ve written a charming blog post detailing all of our children’s efforts which we will post and you can read later this week (and also the reason why this newsletter is late). 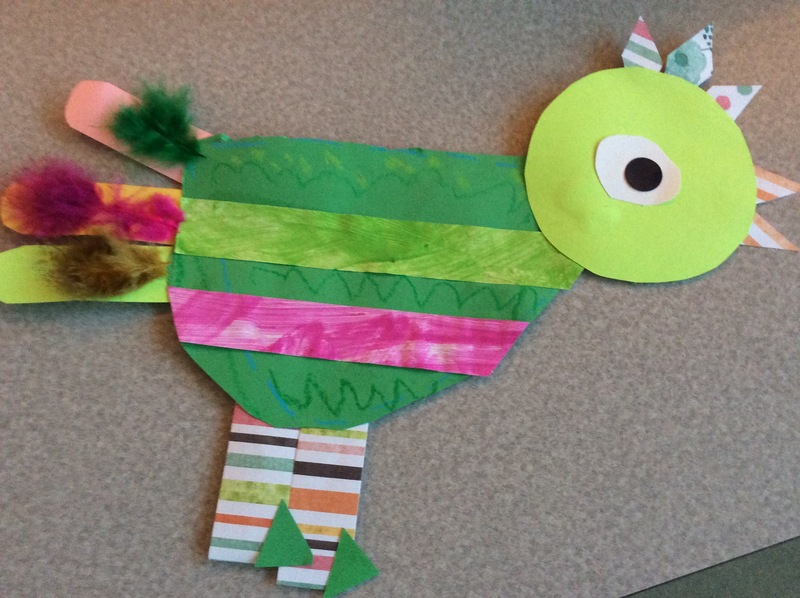 For now, let us say how very, very proud we are of our KinderArtists who each made a sweet birdie using mixed media. It was so fun to work with our children, who were the best of listeners and followed many directions incredibly well. We are always uncertain about how well our art project will be received by the children. As to be expected in Kindergarten, the range of their fine motor skills is vast; we’re trying to find a project that they can all do mostly independently, feel pride and accomplishment, yet is lovely enough beyond the eyes of the artist (it is a fundraiser, after all). We worked on the letter “d” this week, pasting beautiful paper diamonds to a lowercase d. In a moment of thrift, we used up the leftover pieces of scrapbook paper from the boho birds to make some very pretty diamonds. We’re taking our PE classes outside right now with the good weather because this might not happen again. We have been working on fitness, using the playground circuit and we introduced the agility ladder as well following the Physical Literacy (PL) Assessment last week. The Foundation Skills of running, hopping, jumping, throwing and kicking are ones we will be focusing on (we also review skipping and galloping). We’re using the agility ladder to add excitement and challenge for our children whose PL skills are already well developed. Part of the assessment was also the vocabulary, comprehension, and ability to follow the instructions given by the PL teachers, which we will follow-up with in class. 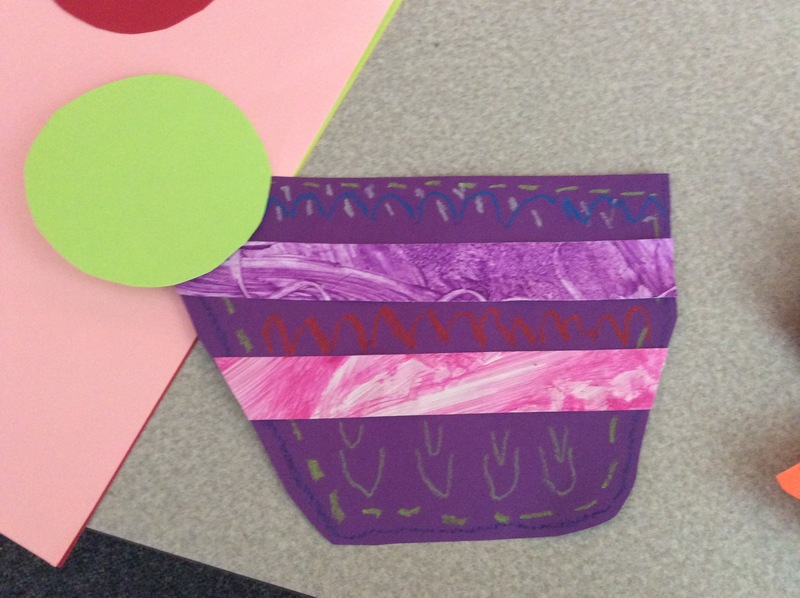 More fun…and art…on Friday with our Big Buddies. 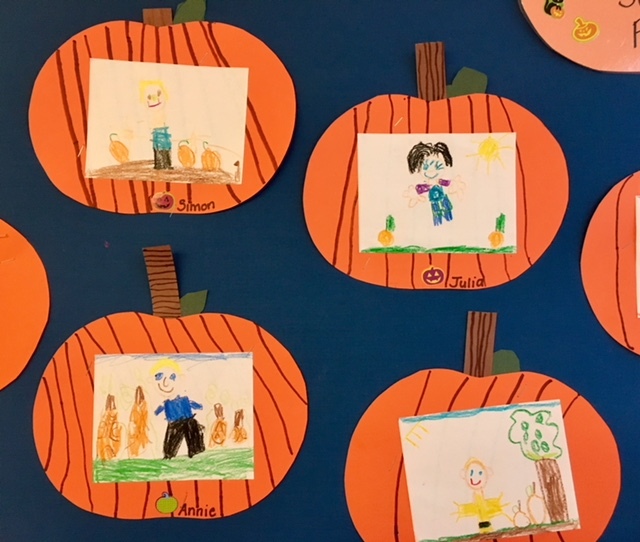 Now, we know we just had Thanksgiving but we realized we wouldn’t see our Buddies again until October 26 (Professional Day on October 19) so we had to make start our Hallowe’en Wreaths. (We personally realise it’s all about perspective when we saw the Christmas decorations and decor in Michaels and HomeSense this weekend, and the Hallowe’en bits and pieces were on clearance, but we digress….). So to keep our excitement in check, we decided to just trace our templates (ghost, moon, pumpkin, bat) and glue them on and save the decorating (once we’ve located our Hallowe’en stickers) for the week ahead. Although we had some sad faces (Grade 7s, not the Kinders), we know we’ll be happier working on Hallowe’en crafts the closer we get to Hallowe’en! Christy and I are not one for rushing through each celebration and holiday. We like to savour and enjoy it for what it is…part of our self-regulation. Thank you again to Mrs. Kennedy, our Teacher-Librarian, for squeezing us all in our Tuesday so we could have our new Library books. We also wish to formally welcome our UBC Teacher Candidates (Student Teachers) Miss Ellis and Mr. Pang to Ridgeview Kindergarten. They will be visiting on Thursdays to observe your Kindergarten Teachers, and have a two-week practicum in November. In the new year, they will continue their weekly visit and have an extended practicum in the Spring. Christy and I are known as School Advisors and we will be observing and evaluating their practise teaching, along with a UBC Faculty Advisor. Christy and I both had amazing practise teaching experiences (Christy right here at Ridgeview; and mine was in the Saanich School District) with very knowledgeable, experience School Advisors. Although we’ve had quite a few Teacher Candidates come through our classrooms over the years, it is always our Professional responsibility to mentor today’s promising young people in the most worthwhile and satisfying helping profession, that of TEACHER. Finally, our heartfelt thanks to our BFF and webmaster extraordinaire, Ms. Cari Wilson (Innovation Teacher for Technology) @kayakcari for creating our new header for theselfregulatedteacher.com. It is gorgeous and we love it! Thanks, Cari!! Monday is Library Book Exchange. Please return your Library Book to get a new one. Thursday, October 18 is Early Dismissal for all students at 1:30 pm. At this time of the year, there’s always plenty of reasons to give thanks and we can’t think of a better one than a great start to school! Our Kindergarten children have worked extremely hard for the past five weeks. They are settling in well to their classrooms, making new friends and learning the importance of looking at and listening to the teacher. No wonder everybody is tired at the end of the day! But this is a tiny fraction of all the children have learned to do. You can read more about what your children know in a previous post, Our Kindergarten Classroom Routines. We were really busy during Turkey week (but then again, when are we not?) 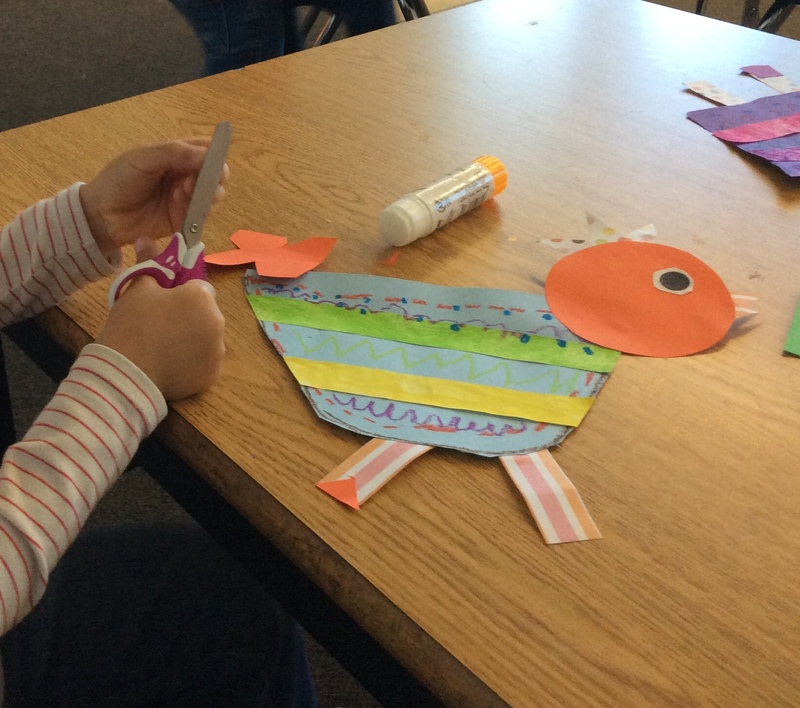 We applied our knowledge of simple math patterns (AB, ABC) to our turkey feathers. 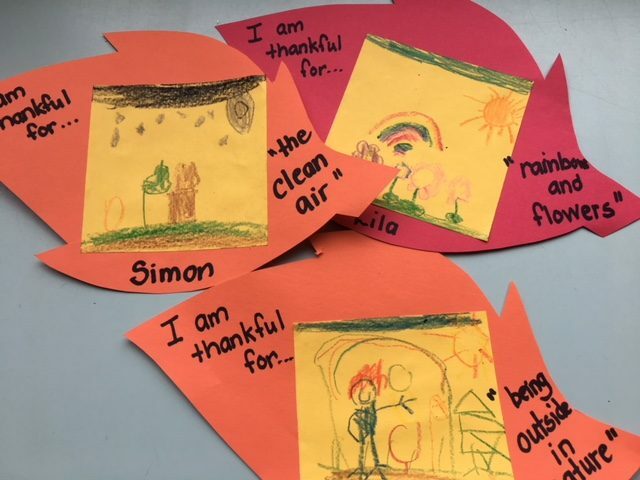 We read several Thanksgiving books as our inspiration for our “Leaves of Thanks.” The children did a great job with their brainstorming about what they were thankful for. We know that children are thankful for what is close to their hearts — their family and friends. It’s all very special. The District Physical Literacy teachers also completed their assessments this week. The children ran “there and back,” hopped, threw overhand, kicked a ball and walked backwards so we could look at their balance. This information is to create a baseline so we know the areas to focus on during PE instruction for our classes, not only for skills but for comprehension of the concepts and instructions. We were thankful for a gorgeous sunny day that the children could be outside and participating in the physical tasks that were set out for them. It’s the holiday weekend so we want to wish everyone a Happy Turkey Day. We’re looking forward to catching up with our own children who are returning home from University for the next few days. We can honestly say that time goes by very quickly when you have children; it feels like our kids were just in Kindergarten themselves and now they are young people starting their lives and creating individual paths for themselves. The time when your children are young is very, very precious. Take the opportunity to be present with them to enjoy the magical adventure of their childhood. There’s so much that we all have to be thankful for. Please keep track of the calendar for Sharing and Special Helper so you know when it’s your child’s turn. We do not allow children to bring in their Sharing on another day if they forget on their own Special Helper Day. Monday, October 8 is Thanksgiving Monday and school is closed. School re-opens on Tuesday, October 9. Please return your Library Books for Tuesday.